Say I’m married with one child and an annual income of $50,000. My total payroll and income taxes will be $4,085.00. Of that amount, $4.42 is the portion of my taxes that goes to funding development and humanitarian assistance, security assistance, and foreign affairs, embassies, and additional international affairs. Holy crap! That’s 1.7% of my taxes! Is that shocking or what? Apparently, 26.3% of my taxes also go to National Defense which I’m sure Congress will tell me is worth it, earmarks included. The figure above makes the following assumptions — 1) that my family contributes 2 percent of my wage income to a 401(k) or IRA, 2) do not itemize, and 3) claims the Saver’s Credit, as well as the Making Work Pay and Child Tax Credits. 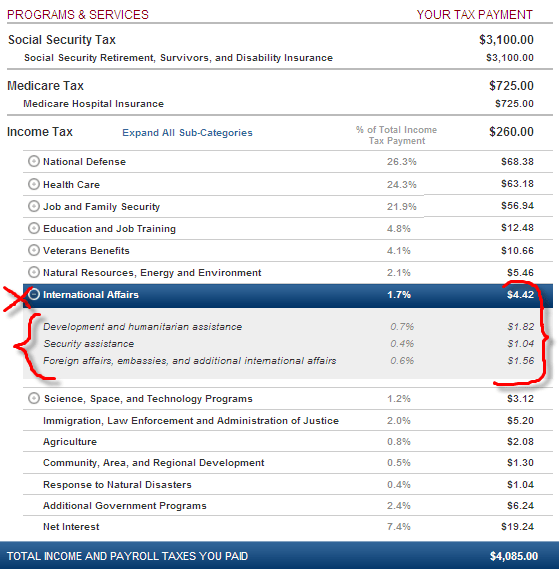 If you go here, you can select four other income levels and see the breakdown on where the tax dollars are spent. If you have your actual tax return you can input your real numbers and generate your own receipt with a breakdown of where your taxes go. In any case, if I break down the $4.42 figure above, I’m paying $1.82 to development and human assistance, which is definitely way cheaper than a Starbucks latte. What can I actually buy with $1.82? Let’s see — a Walgreen’s Diapers. Or a potato/macaroni salad in Charleston, South Carolina which sells for $1.82. I can also get 4 Boxes of Raisin Bran Crunch for only $7.29 (and that’s $1.82 per box)! At least $1.04 of that $4.42 tax money will also go to security assistance. But for $1.04, I can get Clorox Bleach (60-oz.) at Walgreens, or half a pound of sugar. One Thin Crunch Mixed Nuts and White Chocolate Bar also sells for $1.04 in my grocery aisle. The remaining $1.56 of that $4.42 tax money will, of course, go to foreign affairs, embassies, and additional international affairs. What can I buy with $1.56? A can of sardines is available for that price. I could also buy a jar of Skippy Peanut Butter or a 5-lb bag of flour. So, for the price of one crunchy Skippy Peanut Butter, you can march to any US Embassy or Consulate in over 250 places around the world and demand assistance. Is $4.42 a good investment of your tax dollars? Isn’t that a tad cheap? On April 15 without much fanfare, President Obama signed into law the budget deal officially called H.R. 1473, the “Department of Defense and Full-Year Continuing Appropriations Act, 2011”. “While the President did not get the diplomatic and foreign assistance money he asked for in the FY 2011 budget deal (his request was cut $8.3 billion), it could have been a lot worse. The House version of the FY 2011 budget would have cut nearly $5 billion more. Moreover, some in the Congress could and do argue that compared to FY 2010, American’s foreign policy institutions and programs survived pretty well. Compared to the base funding for FY 2010, the new appropriation cut only $781 million or two percent. The administration sees it differently. The White House includes in the FY 2010 total the funds that were appropriated in FY 2009, but rolled over into 2010 (so-called “forward funding”) and the supplemental funds voted in 2010 primarily for Iraq and Afghanistan. The administration therefore starts from a higher level last year and argues that the new budget is a 12% cut from that base. Remember the much touted QDDR? Foreign policy still militarized? Absolutely. Their conclusion is not hopeful. “The fiscal environment for FY 2012 is not promising for American civilian statecraft. The House budget resolution passed last week would cut foreign policy funding (the International Affairs Budget function) 35% or $13.1 billion from the CR level provided for FY 2011. While this level may grow in a Senate resolution, it is going to be increasingly difficult to “power up” the civilian diplomacy and foreign assistance agencies in the emerging budget environment. I think the last time State had it this bad was during the 1990’s, when we were supposedly enjoying the peace dividend at the end of the Cold War. Instead, we had rounds of embassy closures, hiring freezes, reduction in force particularly among locally engaged employees, and USIA was gobbled up into the State Department in 1999. The FY 2012 with the proposed deep cuts in the international affairs budget may be shaping up to be way, way worse. And USAID could be on the line. Quickie: Why can’t the State Department get any love? Author of Afghanistan Journal, Joshua Foust who writes at Need to Know in PBS and blogs at Registan.net has the answer. In the midst of an historic impasse over the 2012 funding of the federal government, Republicans and Democrats agreed to cut billions of dollars from the nation’s foreign policy budget. However, reading the list of what got cut (pdf) one agency is conspicuously missing: the Department of Defense. Most of the cuts to American foreign policy — nearly $8 billion — came from the State Department. What gives? Some readers here may we aware that I’m not the biggest fan of USAID: I think we need to implement substantial reforms to the foreign-aid industrial complex. But you cannot reform an agency if you eviscerate its budget. If some of the middle-management and long-serving career officers are a problem at the State Department, as some ex-employees have attested in private, then cutting the budget doesn’t actually fix the problem. If, as Republicans allege, the State Department is ineffective, then cutting its budget doesn’t actually make the agency any more effective (and since government agencies are not a competitive market, it’s not like some better-designed organization will spring up filled with diplomatic entrepreneurs). It’s no secret that many programs at the State Department are broken or severely handicapped. But it would be madness to think that cutting its budget right when a growing number of crises require strong diplomacy and smart civilian management. A lot of critics point to a 2007 Town Hall meeting, in which a few Foreign Service Officers — diplomats — complained of being stationed in Iraq. The event was hugely embarrassing for the department, but the derision levied at the entire agency seemed misplaced. After all, U.S. soldiers have committed crimes, they’ve whined in public and one even went to jail for refusing to deploy over his rejection of President Obama’s birth certificate. Yet, there is no widespread disgust at the military, or of the troops who serve. Next time you’re at Target, take a look at the bumper stickers on the SUVs in the parking lot. In all likelihood, you’ll find a good half-dozen or more that say “Support the Troops” in one way or another. You will not find “Support the Diplomats” anywhere. […] State Department has about 22,000. The DoD, in contrast, has nearly 450,000 employees stationed overseas, with 2.5 million more employees in the U.S. So with no built-in constituency to argue for its interest, and an acutely lopsided share of the foreign policy budget (under 6 percent), it seems natural the State Department would face cuts first. It never really stood a chance. That doesn’t make it right, however. Defense Secretary Robert Gates has been warning for years of the militarization of U.S. foreign policy — and he’s not alone. Even so, the relentless attacks on the civilian side of the foreign policy budget continue without much public outcry, while cuts to the growth rate of the Defense budget are met with howling and apocalyptic foreshadowing. The $8.5 billion of cuts in the 2012 budget would be a rounding error in the DoD’s $671 billion budget. But in the State Department’s $47 billion budget, it is devastating. Until this dramatic imbalance in spending priorities is reversed — until both parties in Congress agree that our foreign policy should not be dominated by the military — this trend of gutting civilian programs will only get worse. The 2007 Town Hall set-up to fail meeting — oh yeah, whose idea was that again?